The tube is 1 5/8" by 0.095"
My DOM tubing was ERW. Some people think DOM is seamless. Not all DOM is seamless. ASTM A513 covers MT1010, 1015, and 1020, ERW including DOM if specified. DOM can be honed (centerless gound) before drawing over mandrel. The seam may not be easily noticed but exists. I have no idea, but I do know that my tubing is welding along the length. The weld is barely noticed on the inside, and not at all on the outside. The only steel I've bought so far for my car, is the 1" x 1" square for the frame, and sheet metal for the seats and the floor. All the other steel I use is stuff that is lying around my garage, or stuff that my grandpa has given me. I got the tube for my roll bar from my grandpa. At the moment, I'm not sure how to tell the difference between DOM and ERW. I have a basic understanding of how they are made, and what is strongest, but I don't know how to tell the difference from the appearance of the steel. As many will say, if I had the money, I would buy the best. I would have loved to use DOM tubing for the roll bar, but, I can't afford to spend much money right now. I'm in school now, and money is really tight. FYI, I just looked through NASA's rulebook for roll bar requirements for HPDE meaning high performance driving event, AKA a normal track day (not racing!). This should be pretty much acceptable by most track day organizations. To save you the time, they want to see a minimum of 1.5"x0.120" tube for a car under 2000 lbs. To my surprise, they do allow ERW tubing which they don't in competition roll cage construction. Even more surprising (to me at least) is, they apparently don't require any roll bar bracing. Sheesh, I'd rather have a 1-3/8" ERW roll bar with a couple braces than a 1-1/2" alloy roll bar standing free in the breeze. SCCA allows down to 1-1/4" for cars under 1500 pounds, but braces are required (and a diagonal in the hoop is strongly recommended). Even more surprising (to me at least) is, they apparently don't require any roll bar bracing. Yeah, but on the other hand, 1.5" OD x .120" wall is pretty serious metal... all the 16ga, 1" square tubing it's attached to will buckle before the roll bar bends. That's assuming it's integral all the way to the floor. If it's just bolted on at shoulder level it definitely needs braces, but I'm not sure that's legal anywho. http://www.SportsCarDesigner.com .... You want to design your own car... so go ahead. Sports Car Designer is the answer. The mounting point at the corner of the rear bulkhead has a bunch of tube intersecting at it. With a good 4"x4"x1/8" mounting plate hold it all together it should hold the load just fine... locosts have been built that way all along. So, I'm trying to finish up a lot of little things I need to do before I move onto new things on the car. The biggest thing that I need to work on is the position of the alternator. On the passenger side of the car, I need about 1/2" to 3/4" more clearance to get my alternator back on the engine. My engine is shifted 1.5" to the passenger side, to allow for space in the pedal area and for the steering system. Because of this, the alternator doesn't fit right. 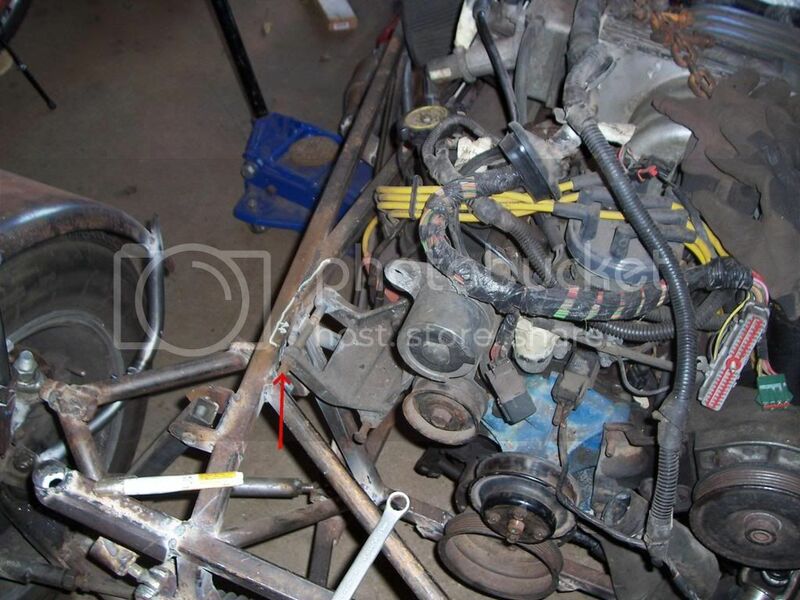 And in this picture, you can see, outlined in white, the area that would have to be cut out to allow the alternator to fit. The bolt that you see in the picture, which the arrow is pointing at, is hitting the frame. It’s preventing the engine from sitting flat on the engine mounts. 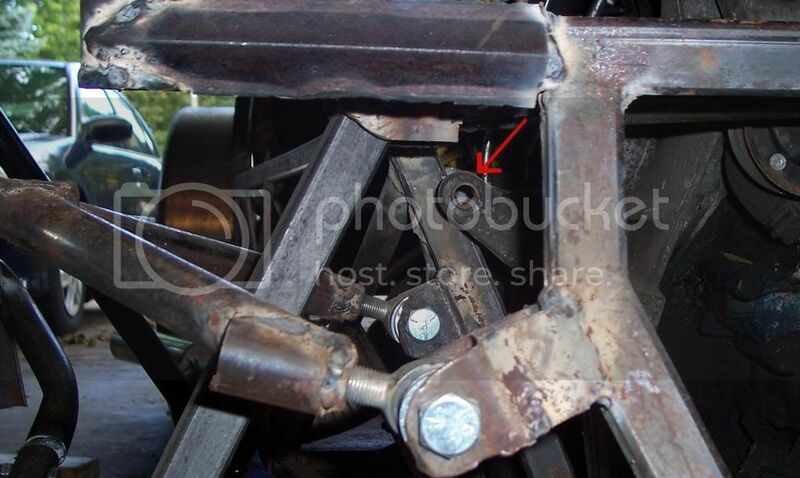 1) I could mount the motor higher in the frame, so that bolt would clear the frame. The downside is that it would be a lot of work (lot of things would need to be changed), and the hood would be ridiculously tall. I'm leaning towards option 3, but I am concerned about the strength of that spot. I know its a high stress area, since its a spot that connects a lot of steel (5 peices join there). And, the shock mount is inches away from the spot which would be cut out. I vote for #2 you can do a lot with a square and a grinder! I definitely wouldn't notch the frame there. I like the clutch helper, how is the pedal compared to a stock Mustang? You could go with a mini aftermarket alternator? They make some pretty small ones. You may have room to move the engine and trans mounts one inch to the left side. Another option is to look at the accessory drives on late 80's 5.0L used in fullsize cars and 89 and newer 5.0L thunderbirds/cougars. If you decide to swap, make sure you get all the brackets, pulleys, and the casting number on the water pump (subtle variations in shaft length and different outlets). It would involve a lot of cutting and refitting on the frame because tube angles need to change. The need for horizontal lateral tube at the hoods edge makes it a bit more challenging, unless you add a nonstructural mount solely for the hood support. There's room on the front of the engine, perhaps you could turn the alternator around and put it where an idler pulley goes with the outside of the belt wrapped around it, so it turns the same way? If you can relocate your alternator or find a smaller one, you should be good to go. I doubt you need the full electrical output the donor car needed. What is the big pulley on the other side of the engine...power steering? Can you ditch that and put the alt over there? Raising the engine seems pretty drastic. If you just *have* to cut into your frame, I'd avoid notching. Just bite the bullet and replace the affected tubes entirely. I frankly don't recommend this, but it beats notching. The original alternator bracketry for early 289/302 engines bolted the alternator directly to the cylinder head right about in the space the tensioner now occupies. That arrangement would pull the alternator back in several inches, but you would need to use the earlier 1G or 2G alternator. The 3G won't fit, but you really don't need 130 amps, do you? Those brackets and spacers are readily available in any Mustang resto catalog. Try www.npdlink.com for one source.